Pentax Imaging Company has introduced the smc Pentax DA 17-70mm f/4 AL [IF] SDM lens designed for exclusive use with Pentax digital SLR cameras. This standard lens with extra zoom offers outstanding, well-balanced handling, and covers the most frequently used focal lengths between wide-angle and telephoto making it ideal for a variety of shots including scenery, snapshot and portraiture. Previously shown in February at PMA 2008, this lens features a 4.1X zoom ratio covering wide-angle to moderate-telephoto ranges, and covers a focal-length range from 26mm wide angle to 107mm telephoto in the 35mm format. When mounted on a compatible* DSLR camera body, the Pentax-original SDM system driven by a built-in supersonic motor, offers exceptionally smooth, quiet autofocus. * This lens is compatible with the K20D, K200D, K100D Super and K10D (with Ver. 1.30 or later firmware installed) and later Pentax DSLR camera bodies. When mounted on other camera bodies, the focus mode is automatically switched to manual. 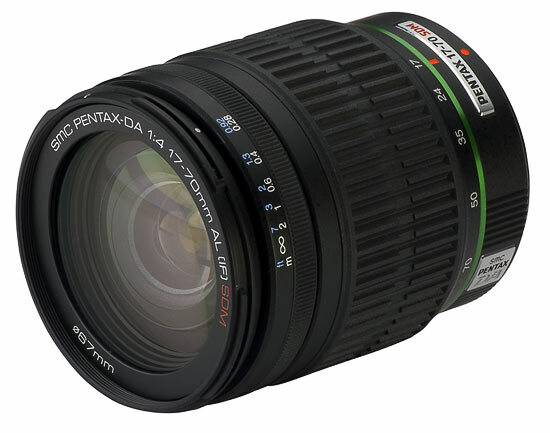 Developed specifically for Pentax digital SLRs,** this 17-70mm lens also features Pentax SP (Super Protect) coating that protects the exposed lens elements and repels dust, water and grease. It also features a Quick-shift Focus System that allows instant switching from auto to manual focus with a turn of the focus ring. **SDM-only focusing lens may be used with non-SDM Pentax DSLR bodies in manual focus mode. Incorporating two hybrid aspherical (AL) optical elements, this zoom lens assures exceptional image quality while effectively compensating for various aberrations. With a maximum aperture of f/4 over the entire zoom range, the lens allows photographers to use higher shutter speeds to minimize camera shake (especially in telephoto applications) or reduce the depth of field to intentionally throw the background out of focus. This lens offers a minimum focusing distance of 11 inches (0.28 meters) over the entire zoom range, and an Inner-Focus (IF) optical design that eliminates lens extension and retraction during focusing operation. From lens coating and curvature to the positioning of optical elements, the lens optics are meticulously designed to optimize the lens's digital imaging characteristics. The image circle is perfectly proportioned to a Pentax camera's image-sensor size. This Pentax lens will ship in July 2008 at US $599.95.